Standing in the doorway was someone we hadn't expected to see at the HQ at all, and we couldn't give away the idea that we knew him. We all stood up, more or less in unison and walked to greet this "new" person, who shook our hands in turn. As he walked in, I took a quick peek outside to see if there were any guards outside the door, but luckily I think we were clear. They either didn't have a clue about us or they were playing it open for the time being. Either way we would have to make the best of the opportunity while we still had it. "If you'd like to take a seat again, I have a few questions to ask you about the capturing of six of the Lone 7." We all returned to our seats, and settled in for some easy questioning. If it had been the guy in the suit, things would likely have become very awkward very quickly. Luckily we had fortune on our side it seemed. "Right, can you start from the beginning and work your way to arriving at the HQ. We need as much detail as possible so that we have a better chance of finding the last member, and maybe evening finding their base." "Well, we're part of bridge team theta, on the towers overseeing the area, when we spotted some commotion at the outpost to the North. We took it upon ourselves to take a look, and caught those six in the act of subduing the guards posted there. From what I could tell, all of the guards there had been knocked unconscious through a tranquillising sedative fired from one of these rifles." "Okay, so how did you come to overpower the six of them. If they were armed, surely they would have the upper hand?" "We went in low and quiet, and managed to restrain two of them with the rifles. The third surrendered pretty quickly, and once we confiscated the rifles, they seemed reasonably cooperative. We could only see six at the time, so whether the seventh was somewhere else we don't know." "What happened after you took their rifles and cleared up the scene?" "We headed down into the tunnel to the checkpo... I mean gate B, and dispatched replacements to the outpost. We left our papers behind in all the commotion but we managed to get through the gate and continue through the tunnel to the HQ. There we were issued with temporary passes until they could get a hold of our papers, and the captured six were detained in the interrogation room." He began to furiously write something down on the papers he had brought in with him, not looking up for a full minute, before placing the pen down and looking back at us. He then stood up, walked to the door, opening it slightly before closing it again, presumably checking to see if the coast was clear. He then returned to the table, reached underneath and tugged on something, before pulling it to the top. In his hand was a small, bulbous device, that had a connection pin at the one end. "Microphone. It's the only one in the room as far as I know, but it'll be enough to silence us from the outside. They can still see us, but not hear us. How are you then? I see this idea to get into the HQ worked pretty well. I couldn't imagine seeing you three in the enemy's armour though." "You and me both, SERVERE. What are you doing here? I thought you were off in the field subverting this whole search for us?" "I was; I sent a small group of the Elite off to a random location that I said seemed plausible. It's nowhere near your base just to let you know. I'm having to be a bit more careful now though. I've got another Elite joining me occasionally on these search runs. He can sometimes hinder my progress, but he's not found anything that suggests you're where I've been trying to hide you." "That's reassuring to know. What happens now then? You've debriefed us... Can we go back to 'bridge team theta'? Or can we have a wander?" "You've got to be kidding! You can't just wander around this place unassisted! There are quite a few guards in the place. It might not seem it, but there are. There are numerous labs underground which all carry out dangerous experiments in secret, often illegal too! They're not going to let a couple of guards wander around for a nosy..."
"So what do we do now then? We need to start searching for the Eyes of Ender quickly so that the others don't wind up being the next set of guinea pigs." "Well I assume the PDA has updated and you've spotted the five large circular structures dotted around? They're the structures that are hiding the Eyes of Ender. I don't know which ones are which, that's classified, but I know they are only likely to be in those. The only way to get to them is through the lab tunnels underground. In the courtyard ahead of here are two entrances leading down. The one at the North leads to the two Northern structures, whilst the Eastern entrance leads to the other three. Here, I'll show you." SERVERE took the PDA from UOPETA and loaded the map up. 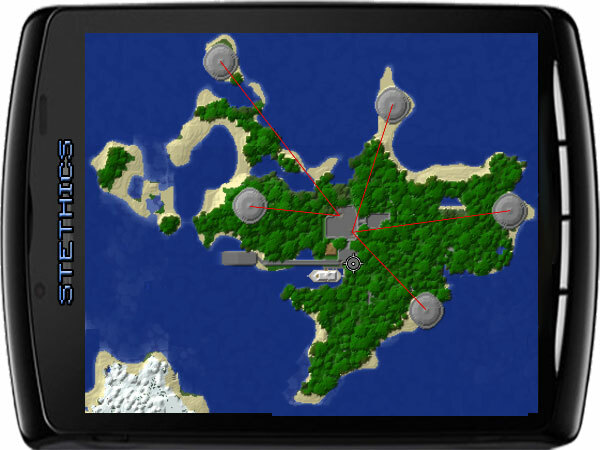 Pressing a few buttons and stretching his fingers across the screen, he passed it back with lines drawn from points on the map to the five structures. "That should help you, and I can go one step further. Hang on a minute." SERVERE left the room quickly, leaving us a little confused as to what to do next. Studying the map, I could see what he had meant by the two entrances leading to the five structures. Hopefully this would help drastically, as it would at least enable us to coordinate where to go with each team. Provided we were able to get the other six out of the interrogation room. The door opened again and SERVERE stepped in carrying what appeared to be a few white sheets under his arm. Leaning against the back wall and reaching up to the camera, he flicked a switch, before laying down what he had brought with him on the table. "These are the standard attire for the scientists that are seen around this area. They always wear these labcoats, and they always have these!" He pulled out a few ID badges from his pocket and put them onto the table. UOPETA picked one up and studied it, looking a little confused. "But these don't have photos...?" "They don't use them. They are bound to a specific cell within the lab area, and depending on the cell you're linked to means you only carry out that specific type of research. It is not allowed for scientists of different cells to mix as their work may be top secret. I managed to get some ID badges that state you're working in labs 1 or 2. They're carrying out similar research so it's applicable for this instance. This should get you into the the labs and tunnels that lead to the first two structures. Put these on, leave the armour and set out. I'll try to find a way to release the other six, or at least get them a similar disguise." "They're not going to miss six fugitives disappearing, SERVERE. How are you going to manage that?" "Leave it with me. Now hurry up!"